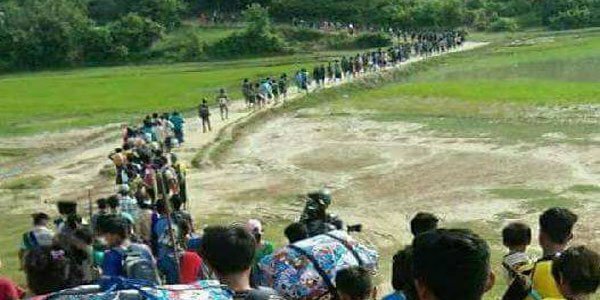 Dhaka – Dhaka has been trying hard to secure global support to mount pressure on Naypyidaw for repatriation of Rohingya refugees, hundreds of thousands of whom fled to Bangladesh facing a brutal military crackdown in Rakhine state of Myanmar. More than a year and a half has gone by since the two neighbours inked an agreement for voluntary repatriation of the refugees, Myanmar has not been doing anything visible to create an atmosphere to take its people back. Rather, the military-driven government of Aung San Suu Kyi has reportedly been engaged with more violence with other ethnic groups in northern Rakhine making Rohingya repatriation possibility a forgotten issue. Bangladesh, which hosts more than a million Rohingya Muslims on humanitarian ground, has been asking its neighbour to take refugees back to their land, ever since the latest exodus of Rohingya Muslims in August 2017. An attempt for repatriation of several hundred refugees in 2018 was failed as the returnees did not want to sink in boiling water. Prime Minister Sheikh Hasina, who chooses dialogue to resolve the crisis, on Sunday iterated her call to a British minister visiting Bangladesh to keep up the pressure on Myanmar. She asked the UK Minister of State for Asia and the Pacific at the Foreign and Commonwealth Office Mark Field, MP, when he paid a courtesy call on the Prime Minister in Dhaka, said PM’s Press Secretary Ihsanul Karim said. “This is a huge problem in the area as the Rohingya have outnumbered the locals,” Hasina said about the Rohingya settlement in south-eastern Bangladeshi district of Cox’s Bazar. She said a vested quarter may use the frustration among the Rohingya for bad purpose. Hasina also told the British minister about Bangladesh’s plan to relocate a portion of the refugees to an island in the Bay of Bengal from the crowded camps in Cox’s Bazar for temporary accommodation. In response, Mark Field described the Rohingya crisis as a ‘big burden’ for the country and wanted to know about their current situation. The prime minister sought more British investment in Bangladesh for mutual benefits of the two countries. She called upon the UK entrepreneurs to invest further in Bangladesh.